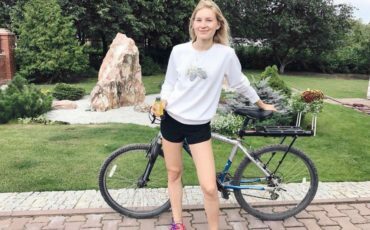 Elizaveta Samoilova this beautiful, blonde girl will take part in the bike ride from Novosibirsk to Tomsk and back! It is around 510 kilometers! From the interview with Elizaveta we know she is going to take Cedar Products to help her complete the ride. not let catch a cold, and even if she does Cedar Nut Oil will cure it quickly! In addition to Cedar Nut Oil Elizabeth will use Cedar Cream Balm on the exposed skin during the bike ride against chapping of the skin, because of the impact of the wind. Also she will use Cedar Cream Balm, because it is very important to moisturize skin especially in such interesting travelings in the fresh air. Elizaveta is prepared for the bike ride in all aspects! We are very happy that Elizaveta Samoilova believes in quality of our products, appreciates and chooses us! Let’s wish her good luck!